NCE UPON A TIME there was a man, an Italian man, a musician, making music for God. This musician liked Gregorian chant. He thought he knew how this famous chant should be performed and was always very suspicious of the so called “semiologists”. Who are they? They promulgate an understanding of Gregorian chant which traces back to the work of the Solesmes Monk Eugene Cardine and his followers. Dom Eugene Cardine (1905–1988), a monk of the Abbey of Solesmes, shed a new light on the interpretation of the medieval neumes, showing that these neumes have not only a value for the reconstruction of the melodies but also shed a great light on the correct interpretation. But the musician, full of his knowledge, mocked these new interpreters of Gregorian chant. Not that he was really into Mocquerau either, having already considered those theories of interpretation worthy of being confined to the recesses of history. But semiology, please! One day this unbelieving musician was invited to a concert in a beautiful roman church called Sant’Agostino, very near to Piazza Navona, one of the most popular tourist attractions of Rome. 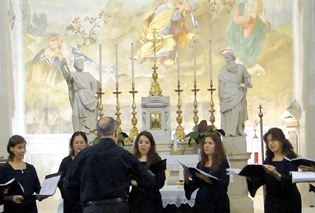 It was a chant concert, the choir was the female choir of the Pontifical Institute of Sacred Music, and the conductor was Professor Nino Albarosa, a student of Cardine himself. The musician really did not want to go, but one of his friends sang in that choir and insisted he go. So when he sat in that beautiful church he was just hoping that this boring concert would finish as soon as possible, so he could attend to more worthy business. But when Professor Albarosa moved his hand to give the cue for the first piece, it was like the angels themselves had gathered to sing together with an international choir that was voicing the praise of God in that very place. It was like the daily time, the Chronos, was suspended to make everyone enter in the time of eternity, the Aion. From that moment on the musician, like a new Saint Paul on the road to Damascus, converted wholeheartedly; understanding that if the angels themselves are singing, this theory cannot be wrong at all. And from that time on that musician, which you guessed, is me, and all present understood that chant is a gift from God; that dom Cardine was a great man and that Professor Albarosa is a great chant conductor; and all lived happily ever after. Alleluia. Amen.